Save time and improve customer loyalty with our automated customer survey module for NetSuite. Our Customer Satisfaction Survey bundle greatly reduces the man-hours associated with soliciting, compiling, and tracking customer data by delivering an automated customer satisfaction survey module within NetSuite. With our Customer Satisfaction Survey bundle, you will no longer have to manually invite customers to participate in your surveys or manually transfer captured data into corresponding customer records. Sales and Support Departments now have the ability to automatically generate personalized survey links for customers within NetSuite. This provides increased efficiency and ensures that the customer relationship management (CRM) process begins and ends within your NetSuite account. Invitations to participate in satisfaction surveys can be automatically sent to customers based on a pre-set, system-wide schedule, providing the ability to determine the frequency at which your customers are being solicited. Customer data from submitted satisfaction surveys is saved in the customer record, contact record, and support case record within your NetSuite account, allowing Support Representatives and Managers to view detailed reports and follow-up if necessary. At Aminian Business Services, we take pride in having designed and implemented a number of projects for customers who were seeking solutions that are not available in a NetSuite “out-of-the-box” configuration. Contact us today to discover how our seasoned staff can customize end-to-end business processes to your precise business requirements. Each customer survey and survey invitation can be easily tailored to meet your exact requirements. Surveys created in Aminian’s Customer Survey for NetSuite allow participants to answer survey questions within a variety of field types. Examples of these fields include, drop-down menus, radio buttons, check-boxes, and free-form text. Invitations to participate in satisfaction surveys can be automatically sent to customers based on a user-defined, system-wide schedule, allowing your Sales and Customer Support departments to determine the frequency at which your customers are being solicited for information. 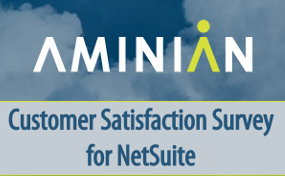 Aminian’s Customer Survey for NetSuite creates a standardized link to a survey that pre-populates all relevant customer, contact, and transactional information, eliminating the need for your customers to enter personal information. Results from submitted customer surveys are saved on the customer record, contact record, and support case record within your NetSuite account. Aminian’s Customer Survey for NetSuite optimizes all captured data to provide real-time reports for Sales and Support managers.